Football Zombie is a tough and fast zombie which first appears in Plants vs. Zombies. 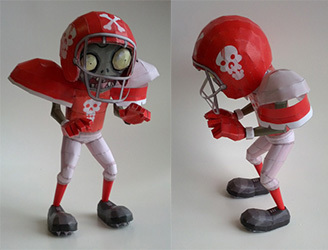 Football Zombie itself without a helmet is only as strong as a Zombie, but it cannot be damaged until its helmet is destroyed or stolen by a Magnet-shroom. This entry was posted in Halloween, plants vs zombies on 11/12/2014 by ToyXD.